SANTIAGO, May 11 2016 (IPS) - A ban on harvesting shellfish in Chiloé due to a severe red tide outbreak sparked a social uprising that has partially isolated thousands of local residents of the southern Chilean archipelago and revived criticism of an export model that condemns small-scale fishing communities to poverty and marginalisation. “I was born and raised on this island,” said Carlos Villarroel, the president of the Mar Adentro union of artisanal fishers in the municipality of Ancud, 1,100 km south of Santiago. “I am the son and grandson of artisanal fishermen. My father, who is now 70, taught me and my brother to work out at sea. None of us ever suffered before when there was a red tide,” he told IPS by phone. But Villarroel and another 5,000 fishers in the southern Chilean region of Los Lagos are affected today by the red tide, a phenomenon caused when microscopic algae reproduce and cluster in one area of the ocean. This “algal bloom”, which contains toxins lethal to marine life and also affects human health, can change the colour of the water – hence the name. The latest red tide, the cause of which is not yet totally clear, and the solution for which is still being studied, began in February and reached its current intensity in April. This prompted health authorities to ban the harvest of shellfish within 1,000 kilometres of the country’s southern Pacific coast. Small-scale fishers responded by launching protests on May 3, which have included roadblocks that have cut Chiloé off from food and fuel supplies and left local residents without transportation, classes or pension payments, while hospitals are facing serious difficulties and hundreds of tourists are stranded. Thousands of the archipelago’s local residents have taken part in the demonstrations, complaining about decades of neglect by the government – the same complaint that sparked a similar social outbreak in 2012 in another southern region, Aysén. 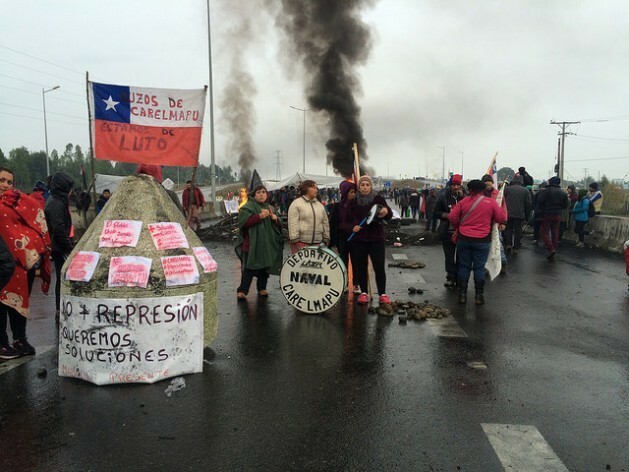 On Monday, May 9, protests also broke out in Santiago and other cities around the country in solidarity with the demands voiced by the people of Chiloé. The archipelago has a total territory of 9,181 sq km and is home to some 167,600 people in this country of 17.6 million, which has 6,435 km of shoreline. Chiloé Island or Isla Grande, the main island, is the archipelago’s political, social and economic centre, where the two main cities are located: Ancud and the provincial capital Castro, world-famous for its palafitos, picturesque wooden houses on stilts. Chiloé is also known for its local myths, legends and beliefs. Aquaculture and fishing are the economic mainstays of the islands, followed by the production of potatoes and grains, and crafts using fibers, wool and wood. An estimated 80 percent of the population depends on fishing. He added that the conflict brought to light the neglect suffered by this part of Chile and the shortcomings of the current model of development, where large-scale seafood exporters largely monopolise profits in the industry. Skewes said that in this conflict, “local communities have more clearly seen the neglect and vulnerability they suffer, and how economically powerful groups operate without curbs. “Apparently the convergence of these factors, added to the loss of a fundamental component, seafood harvesting, triggered this social outbreak,” he said. The union headed by Villarroel represents 35 fishers who mainly catch the Chilean blue mussel (Mytilus chilensis), Chilean abalone (Concholepas concholepas), the hard clam (Mercenaria mercenaria) and the surf clam (Mesodesma donacium). All of these have been contaminated by the red tide. In previous outbreaks, “the seaweed hadn’t been contaminated, but now it has been. We’ve never seen that before,” Villarroel said. The protests, which have included the burning of tires and clashes with the police, worry the government of socialist President Michelle Bachelet, which offered 1,100 dollars indemnification each for 5,500 artisanal fishers, to be paid in four installments, subject to the evolution of the red tide. The compensation, which also included a basket of basic foodstuffs worth 37 dollars, was rejected by union leaders, who argued that the amount was too small and that it wasn’t being paid to all of the affected fishers. In a new 28-point list of demands, they demanded the payment of 2,650 dollars in six installments, cancellation of their debts, and the declaration of a large part of Chiloé as a “disaster zone”. They also called for greater regional control of local natural resources, lower fuel prices, a special regional minimum wage, guaranteed public health coverage, and a regional university. Most scientists blame the red tide on climate change, which drove up water temperatures and caused an increase in algae and toxins. But fishers and a number of experts blame the salmon industry, because it dumped nearly 5,000 tons of dead fish in the Pacific after they were killed by an earlier algal bloom. However, SalmónChile, the salmon farming industry association, said the dumping of the fish “has no relation to” the current red tide, because “what is happening today has occurred normally for a long time in this area,” although with less intensity. A study commissioned by the government to determine what caused the red tide could help clarify other unusual phenomena that have happened in recent months, such as the beaching of 337 sei whales in the gulf of Penas in the south of Chile in late 2015, or the mass die-off of 10,000 giant squid along the coast of the southern region of Bío Bío in January. In addition, in the first week of May, some 20 tons of sardines washed up along the shore in the southern coastal region of Araucania – a repeat of a similar phenomenon involving more than 1,000 tons of sardines in mid-April. He said water temperatures in Chiloé Island’s Reloncavi Sound rose between two and four degrees this year, leading to blooms of harmful algae. The expert said attempts to combat the red tide phenomenon around the world have been ineffective and will eventually have negative impacts on ecosystems. In the midst of efforts by the government and scientific researchers to control the problem, Chiloé island residents remain adamant in their demand for assistance in keeping with the magnitude of the catastrophe, while at the same time insisting on measures to address what they describe as the long-time neglect of their region. Vegetarians could tell you what “other human factors” to expect to find when you do the research to determine what caused it. .It is a wonder that this is not being more intensely researched and results disclosed!